In this article I’ll tell you about Salt Water Aquarium Fish. Taking care of salt water aquarium fish is not as difficult as you may think. 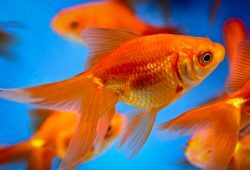 Although keeping a saltwater aquarium is not as simple as maintaining a freshwater tank, it is not rocket science either. 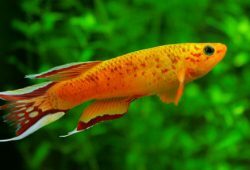 You can be successful by following these few tips for taking care of salt water aquarium fish. Before you even begin assembling your salt water tank, do the research. 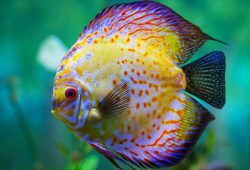 There are many species of salt water aquarium fish, and you want to know as much as possible about the particular fish you choose for your home aquarium. Make sure you find out their feeding habits, living conditions and water requirements. Just like us, fish like certain kinds of food, and they don’t like to eat the same thing all of the time. The first thing to remember about food is to keep it close to whatever your salt water fish would eat if they were living in the ocean. There are many varieties of saltwater fish food available in pet stores, and you can buy flake food, tablets or frozen food. You may also want to add vitamins to your fish food to make sure they are receiving all of the nutrients they need. If you have done your research, you will know what type of food your fish like best. Once you get your fish, observe them when they eat to find out how much they are comfortable eating. Never overfeed your fish, as wasted food builds up in the bottom of the tank. Only give them as much as they can completely consume in 2-5 minutes. You may want to remove any uneaten food once your fish have stopped eating. Observation is the key. Watch them and repeat whatever food portions seem to work best. Salt water aquarium fish do best when they are living in an environment that closely resembles their natural habitat, which in this case is salt water. You can count on healthy, happy fish as long as you properly maintain their water. This means testing the water every day to make sure that the pH, salinity and temperature all remain at healthy levels. Make adjustments as necessary according to your test results, and keep the filter clean as well. 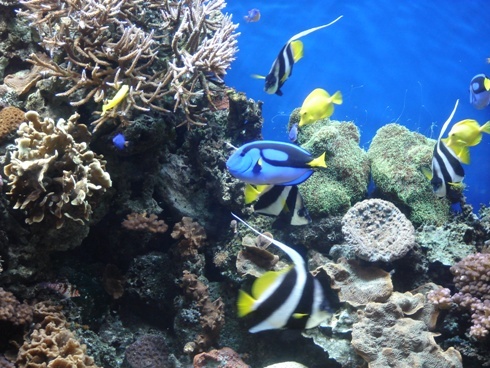 Saltwater fish come from the ocean, where they are surrounded by other living things. When starting your salt water aquarium home, it is important that you include as many natural features as possible. If you can, create an aquarium environment that includes coral and live plants that resemble those your saltwater fish would live with in the wild. Your saltwater fish will be happiest and healthiest if they are in an aquarium atmosphere that closely resembles their natural home. A home aquarium is limited in size, so make sure not to overcrowd your saltwater fish. It is usually recommended to have one small fish per ten gallons of water in the tank. Take into consideration how big your fish will grow when choosing the types of fish and how many you will purchase for your saltwater aquarium. Here again, research is the key to success.